Plot app 2. 55 acres with full planning permission for erection of 8 dwellhouses for sale as a whole or can be sold individually. Price £195,000 Entry by arr. Viewing contact solicitors. We offer for sale this superb development site in the small village of Ruthven affording fine views over the surrounding countryside. There are various options to purchase the house sites which are detailed below. Once the first site is sold the Seller will contract the Services to be in installed but connection to these services will be the responsibility of the Purchaser. There is an incentive for the first site sold. Aberdeenshire Council Full Planning Permission App/2015/2790 is for the erection of 8 Dwellinghouses and Planning Permission along with architect and site plans are available by request from our Keith office. Ruthven is a quiet hamlet located approximately 2 miles from Cairnie and 7 miles from the town of Huntly. Huntly is a busy north east town with a population of just over 4,000, situated on the main road and rail route between “The Granite City” of Aberdeen and Inverness. Huntly has various leisure amenities including swimming pool, 18 hole golf course, bowling green, cricket ground, and Nordic Ski centre. As well as a wide variety of shopping facilities there are two new supermarkets. The town also has a Health Centre and hospital. Secondary education is available at the well-known Gordon Schools. Nursery facilities are also available. The house site measuring 2.55 acres (1.03Ha) with Full Planning Permission. Plot A will be the first site sold. The services will be contracted and paid by the Seller, but connection charges is the responsibility of the Purchaser. 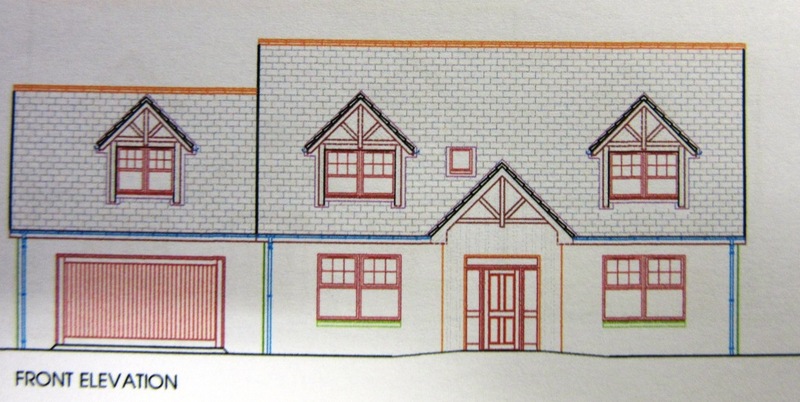 There is an incentive for the sale of Plot A, in that the Seller will provide kitchen units and white goods and bathroom fittings and carpets up to a total value of £25,000 to the purchaser of plot A, which will be the first house site sold - but the building would need to be erected promptly to benefit from this incentive. Details of this incentive to be discussed between seller and purchaser. This contract will be between the Seller and Purchaser direct and not the Selling Agents. Plot A will be the first site sold. The Seller will provide a contract/quote from a builder to complete the house. The quote and contract will save the purchaser time and uncertainty as the cost for a completed build will already be in place. The contract, once the site is purchased will be between the Purchaser and Builder direct. The contract will be passed to the Purchaser. The Seller or their Agents will not be involved with construction or contract to build. Individual site, Plot B - H after first site Plot A has been sold, services will be in situ. The Purchaser will be responsible for the connection charges and own pricing to build. However, the Seller will provide a contract/quote from a builder to complete the house. The quote and contract will save the purchaser time and uncertainty as the cost for a completed build will already be in place. The contract, once the site is purchased will be between the Purchaser and Builder direct. The contract will be passed to the Purchaser. The Seller or their Agents will not be involved with construction or contract to build. Individual site, plot B – H, sold as the first site, with similar terms per Option 2 or 3 (revised build price). However, the price of sites B – H will be higher than plot A. Seller is prepared to discuss proposals. NOTES There is a further 1.4 acres (approx.) which may be added to plots F and/or G to be used as either an extended garden area or pony paddock. The Seller will consider sub dividing this area into ¼ acre sections to be used as allotment, pony/paddock etc and offered to purchasers of other plots. Whilst detailed Planning Consent exists for these specific house types, purchaser is able to apply to Aberdeenshire Planning Authority for non-material variations or revised house type. GENERAL No services are connected at present but will be once the first house site is sold. INFORMATION PACK Information pack available on request to include Architects plans and layout. Full Planning Permission. After a reasonable period of advertisement a closing date for offers may be fixed and all parties who have SPECIFICALLY registered an interest will be advised. Notwithstanding the foregoing, the sellers reserve the right to enter negotiations and conclude a bargain with any interested individual. All offers should be addressed to Messrs Peterkins, Solicitors, 145 Mid Street, Keith. Affordable Housing Developer's Contribution. Note that the seller has dealt with the "Affordable Housing Developer's Contribution" and the purchaser will NOT have to make a Contribution, effectively making a significant saving compared to other building sites. DIRECTIONS From Huntly on the A96 towards Inverness pass the Ashgrove Filling Station and around ½ mile take first on the right at the sign Cairnie, continue straight on this road until you reach the village of Ruthven, turn right at the crossroads at the end of the village, this takes you onto School Road, continue until you pass all the properties on the right and the site is immediately after the buildings on the right.